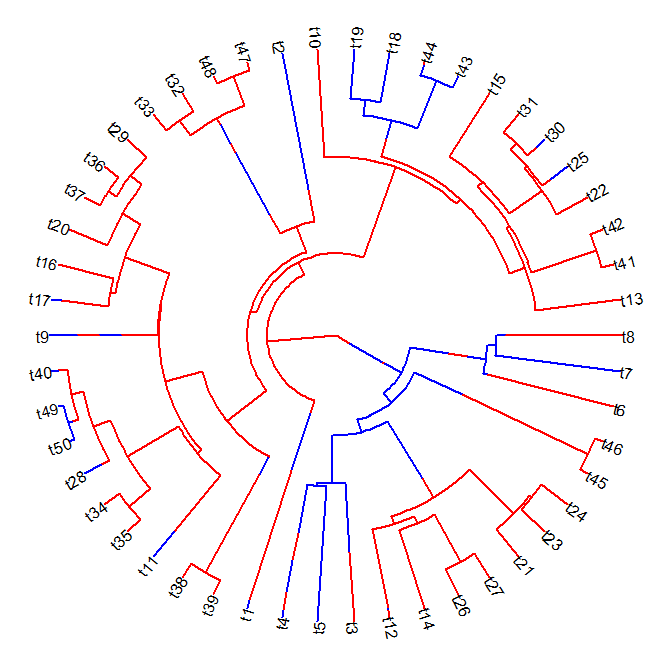 Phylogenetic Tools for Comparative Biology: New version of plotSimmap with type="fan"
Today I posted twice (1, 2) in response to Rafael Maia's early morning query about plotting stochastic mapped trees in a circular style. My earlier posts were about plotting the structure of a circular tree and adding a mapped discrete character using colors. The second challenge is making sure that we have a plotting window with enough space for our labels. For this, I stole a trick that I used in the function phenogram and described here. Code for the new version of plotSimmap is here. I have also posted a new phytools version (phytools 0.2-71). Note that I have not applied all relevant options in plotSimmap to type="fan" yet. This will come in future. For now - let's check out the version we have. Note that we need to first install the package plotrix. Note: type='fan' is in development. Most options not yet available. A miracle - it works! well that was quick! :) thanks Liam, I'll give it a try! !